BoxId: 578551 – New: Cerebro for Lync 2013! New: Cerebro for Lync 2013! With a new version, colima Cerebro now supports the new version of "2013" for Microsoft Lync. Microsoft Lync 2013 is a Unified Communications Platform suitable for businesses, the basic functionality can be optimized with the modular application software "Cerebro", for example with the requested telephony functions "Universal Call Pickup" and "BusyOnBusy". Cerebro Release 2013 can now be downloaded from the colima website and tested free of charge. With Cerebro colima offers individual modules that can be flexibly combined. Currently the two modules are Universal Call Pickup (call pick up) and are BusyOnBusy (second call suppress). With the new Cerebro Release for Lync 2013, BusyOnBusy now works with call forward chaining. Furthermore, e-mail notifications are now also possible for both modules. A significant simplification of the setup process is achieved by that there is with this Cerebro version only one installation file: Both new installations and updates are done with the same setup package regardless of the Lync Server version. Thus, only one setup file is needed for both platforms Lync 2010 and 2013. This makes it simple and clear for the Lync Admin to install and maintain Cerebro. 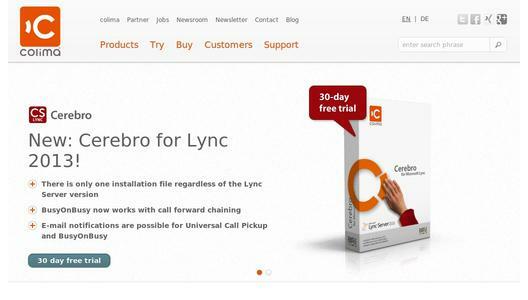 Cerebro for Microsoft Lync 2013 can now be downloaded from the colima website for a 30-day trial period free of charge and without obligation. 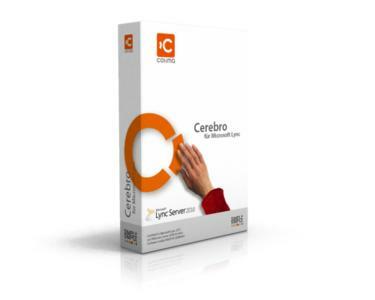 Those who have bought Cerebro for Lync 2010 with a subscription, the Cerebro Release for Lync 2013 is included as an update in the subscription. Universal Call Pickup (call pick up): With the Cerebro module Universal Call Pickup, calls to colleagues phones can easily be picked. Cerebro Universal Call Pickup works independent of manufacturer and model with each Lync phone and regardless of whether the Lync Desktop Client is started or not. BusyOnBusy (second call suppress): With BusyOnBusy second calls to the Client and the IP Phone can be suppressed when the user is already on the phone. Upcoming modules are Boss / Admin, Black or White List, Offline Instant Message and Presence Enhancements. Cerebro uses native Lync technology that is 100% compatible and has a "small footprint"
Cerebro runs on Survival Branch Appliance (SBA), so that, for example, employees in branch offices can utilize Cerebro instantly. Cerebro is interesting for the following target groups: businesses, administrators and Lync users. For Lync hosting providers, manufacturers of Lync add-on products, application manufacturers, distributors and system integrators it is also advantageous to participate in the Expert Program. Further information on the Expert Program can be found at www.colima.de. colima communications is a medium-sized software company for simple and intuitive Unified Communications products. For over 15 years colima has inspired many prestigious clients across all industries with comprehensive solutions for automatic call distribution (ACD). High quality solutions for Microsoft Lync will be the focus of the future product range. 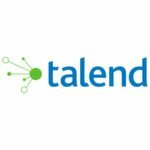 Its clients include: Volkswagen AG, Michelin Tyre, Stiftung Warentest, IBM Business Services, Fresenius Netcare and many more. colima communications is represented at several locations in Germany and has its head office in Leipzig, Saxony. More about the company can be found at http://www.colima.de/en. Microsoft Lync is an enterprise-ready unified communications platform. Lync connects people everywhere, on Windows 8 and other devices, as part of their everyday productivity experience. Lync provides a consistent, single client experience for presence, instant messaging, voice, video and a great meeting experience. Lync 2013 users can connect to anyone on Skype, enabling rich communication with hundreds of millions of people around the world. Lync 2013 offers a clean new look to help you communicate quickly and easily. The new Lync makes it easier than ever to start an instant message (IM) or a call. You can start a video call with just one click and even see a preview of your own video in the invitation. The new Lync adapts to your own personal workflow, whether you’re in the office, at home, or on the go. Lync 2013 also provides new ways to organize your contacts so you can quickly find the right people to help you get your work done.